Why would the eyes glow red? That doesn't make sense. I've never seen a animals eyes glow red unless you shine a light at them at night. Alligatores eyes glow red with a light shining on them. Maybe its part alligator. I grew up encountering this entity during the early 50s. Point Pleasent reports if this entity came out as John Keel told me when I first spoke to him about it at one of his group's meetings in Manhattan. He was the one that first called it Mothman to me I and my brothers knew the thing as a Gonzwell,Gonzwell, or Mr. Gonzwell depending on the form it took when it came to our bedroom window during the night. I believe my report old that it may be still may be lis listed some where on this site. It was not an animal but a shape shifter or a nature spirit as I was told by others I later spoke to about it. Its eyes not only glowed red but sectrumed into other colors too. They projected this light not reflected it. One of the reasons it say entity and not animal when I speak about it. My article on it here is entitled Mr. Gonzwell what was it? It has been posted online science the 90s. If you cannot find it here Google the title or visit my old sites url to read of my full experiences with this. Quantum Physics is only now just begining to tap on the door that will explain encounters with these type of entities. I was on my porch two weeks ago looking out over the railing at the sky. My eyes caught something to my right coming at me. This thing was huge. It flew by me with a huge wing span at a altitude of the railing I was leaning on. It glided like . flew out to the garage at the end of the drive. Too dark to see much else. I could not make out the head on it. My husband says it may of been a huge owl. And I hope it was Auntym Chicago is just too close to me. . this is giving me the creeps . I won't want to go out any more. It made no noise and the wings did not move. Just stretched out to make it cover one side of the drive to the other side. Why doesn't someone get a photo of it or a video? That could be the same thing that folks in Chicago have been reporting. If the whatever it is really does fly it's not that far down to Bloomington. It could have zipped down there in no time. Keep a look out for it and maybe you can get a picture of it next time. Back when I first went online with AOL and posted my experiences with Gonzwell the first responders were mainly people from Chicago. I have no idea but it seems that these entities and or phenomena are want to be near water. Brook Ave where I first started to encounter this entity was so called because of the brook that ran below it. These days the Missing 411 series of books highlights the nearest of water to this type of phenomena. Hi Posey. Yes, I recall reading about your experience with this 😊. I’m going to read it again. Thanks! Read about gonzwell, and then went in to your “paranormal site”. Read for a bit..... oh man. Your dreams. Like mine. Came back here, and experienced something weird in the meantime. Will try to explain in a bit. Im actually laying down just now for a nap. I know that sounds weird in itself- will elaborate more later. The thing is those are not dreams. The full experiences with Gonzwell lasted about ten years. And he was known as the King of the dream demons because Mom told us it was very intense nightmares we were having. But what is it when you start encountering these things in the full bright of day? Thanks to some books Ralph bought back from the army I later learned he was what some Native American shamans called an Allie. Read some of the works of Carlos Castaneda if you still can find them. It was those books that help me keep my sanity. Yes. I have read several books by Carlos....and that was back in the day when I had time to read an entire book in a day, or a night. He (Carlos) is the reason why I think the drug mary jane is “bad” . Not for everybody (of course). But he was the first person I ever heard talk/write publicly about “her”, and how “she chooses who she likes”. I know a lot of people enjoy smoking her... and she is also medicine used correctly. Point being, MOST people will scoff at the things Carlos wrote about.... but it sounds like you agree with me that he “knew” certain things (and had a way of communicating these things between people like me and you). “Within the cracks of the paranormal”. You see, I’ve decided to not be so fearful anymore. My body requires rest more than most people, so it is detrimental to my health to fight sleep. Carlos (and others such as yourself, Posey) no longer ARE what keeps me “sane”. For me, I “use it” as an attention-getter. It is a “glitch” I feel that is telling me to “PAY ATTENTION”. Sure, sometimes when I KNOW that I am going to be late somewhere, I will literally pray that I am not late. That is very cheap of me- and I’d rather not do it (not saying that it always works). Anyway, in “return of the other”, there was a lot for me. And I know that when you mention “the chosen” you are not bragging or anything. It is just the way things are. I hate the part of dreams about something making you fall asleep in dreams, or tricking you about “waking up”. Do you know of anyone who also talks about this problem? Last but not least, the question I am about to ask you is very strange. I have read a lot of what you have offered on the internet, and have not seen this question addressed. I can understand reluctance to talk about this, because “movies” make it always about something sinister. Not so much as writing but sunburned and believe me I don't do the sun tan thing don't need to and some of my meds warn me not to. But the weirdest was a perfect pentergram made out of pin pricks that appeared over night in the middle of my nabel. No idea what caused it and it only happened that one time. I bet a lot of people look to your “blogs” for answers! I have shared so much of my “weirdness” on here that I have to keep some things to myself. For awhile. Like I had never told anyone that the “beings” that took me underground (? seemed like underground on planet Earth; but how would I know?) NEVER SHOW themself/himself. “They” are like a guide showing me things, and I “hear” them, but whenever I turn in their direction they turn with me and stay just outside of my periphery. This started when I was a kid, and I just accepted it I guess (instead of really trying to see them, or ask them why they did this). They always stood on one side of me. A guy came on TEOR and mentioned this happened to him.. so I got emotional, I guess. I love the way you explain your experiences! People on TEOR are familiar with how I speculate all kinds of “questions”, and you always get right to the point! What Mr. Gonzwell has said. Why you think he could be a nature spirit. Why maybe he made a point to talk to you and Ralph. Today, in your post, you mentioned the missing 411. I dont remember you talking about that before... but yeah; thats on my mind these days, too. Like you, I have “noted” that many of these experiences (including mothman) are near water.... and almost want to say that people are lured into the water. Including the “drunk drownings” of young men in places like Chicago. I know that to some people it looks like an “opportune serial killer”. As you know, I sometimes “hear things” in water flowing. Even in my own bathroom!? 😲😊. For me, it (again) is a way of knowing what “mood” I am in. What else can we do but really try to know ourselves?? More and more I realize that I am “blessed” because not all my experiences are truly scary. I am still fighting the notion that the wilderness can be a scary place. I think that if I were to get lost, that some “being” would HELP me find my way to safety. After all, “someone” has taken me to weird other places and never left me “alone” there.... why wouldnt I start thinking that the lost thing couldnt happen to me? To think of murderous humans hiding and stalking our wilderness areas.... ugh. So also dont think that I have some desire to go camping. This is all just very, very sad; really. As for, the talk about a “shaman alli” (did you say in your articleaboutgonzwell that Ralph was an “allie”?) here is an interesting article that also mentions Casteneda. I didnt read all of this following url. I dont even recall reading about this in Casteneda’s first book (though I mentioned mary jane could be a “her” that either liked someone or not). I just dont remember the terminology. Or even entertaining the idea of a “familiar”. There are similar stories in other faiths that talk about if you can get the “geni” to tell you its name, you have “power” over it (it becomes your servant). Its all “talk” that nowadays kids just think that they are playing a video game like warcraft. Anyway, I had to look up “shaman allie”. 😊. Enjoy the first few paragraphs. As to “mothman”, or mr. Gonzwell, I guess some people could consider it as a “tulpa” or even a wayward “golem”. Which is actually kind of weird to think of the mothman being one of those. Because a couple of us here on TEOR have considered that the “mothman” is something lonely and left behind. Mr Gonzwell only spoke when in the human form and then it only complained about how man abused the land. I later learned from a friend that land was sacred land to the native American tribes of that area. Ralph was my irish twin and he and my older brother Chuck all slept in one bed back then. Which I think is how they came to know of Gonzwell. My brothers were avid readers and when he spoke about his crazy brother Butch to his army buddies one of them directed him to read those series of books. He was shocked as to how much Carlos's experiences matched up with thing he heard me talking about as a kid and that is why he introduced me to those books. Gonzwell in no way was a topaz but a real living entity a I am sure the so-called Mothman is. So for me none of those other explanations apply to it. This may help you understand what it is I am trying to convey to you about Gonzwell. Please read but note there is much more to this experience than is written here. Sir - I heard you on 'Paranormal Horizon' radio last night, and tried to call-in but the show was ending. You were talking about inter-dimensional creatures. I believe I saw something that may fit that bill. In July 2011 my wife and I were spending a weekend at a friend's cabin, about 15 kilometers north of Manitou Falls, Ontario, Canada. We were both sitting on the porch looking into the woods. There were two spotlights shining off the porch, so the woods and the open area in front of the cabin were well-lit. I had spent a lot of time in this general area as a boy, and I was aware of the wildlife that lived there. It was close to midnight, as we sat and talked. It was a very mild still night, but for some reason the usual sounds of the woods were subdued. I wasn't alarmed, but it did seem strange. Sometimes when a Lynx hunts at night, things do quiet down; so I assumed that may be what was going on. I kept my eyes open just in case another predator was about. Eventually my wife wanted to go inside, so I obliged her and followed. I left the porch spotlights on. We went to bed around 1:30 AM and both of us quickly dozed off. The next thing I remember is my wife shaking me, telling me to wake up. She said she had heard a 'scream' coming from the from of the cabin. She wasn't used to being in the outdoors, so I told her it was either an Owl or Lynx. She insisted that no animal could have made that terrible noise; that it sounded like a woman was in distress. I looked at my phone. It was 2:33 AM. I got out of bed and walked into the front living room. I looked out the window, but didn't see anything. She was right behind me. Then the scream pierced the night again. This time I definitely heard it, and it wasn't like anything I've ever heard before. We stood by the cabin window and watched the woods. About 10 minutes later, we heard something on top of the cabin porch roof. It sounded like it was jumping up and down. It was so loud and forceful, I thought it may go through the porch roof. We continued to watch, when all of a sudden this huge winged creature jettisoned from above towards the woods. It was massive and dark in color. The wings were fully open and not moving; like it was gliding towards the trees. We caught a decent look of this creature as it sailed upwards into the dark sky, then descended back towards the edge of the woods. It performed this maneuver two more times, until it came streaming, and screaming, towards the open ground in front of the cabin; and then vanished! The wings had been tight against the body and it looked like a dark missile about to slam into the clearing, but disappeared before it hit the ground! We both jumped and let out a huge gasp. It was the most shocking experience I had ever had. My wife was wide-eyed and had to sit down. What in the world was that thing? I have tried to comprehend what we witnessed that night, and I still have no idea as to what it was. It had arms and legs like a human, but the body was scrawny and flexible. It's hard to describe. The head was barely visible. Overall, I'd guess it was 4 feet or so in height and the wide billowy wings spread out to at least 15 feet when fully extended. The scream was the most memorable part of this experience. It really did sound like a frightened woman, but the decibel level made our ears uncomfortable. A few days later, I asked my friend if he had ever seen anything unusual at the cabin. The most exciting event he could recall was a Badger getting into the kitchen one night. That was the extent of it. I decided not to go into details with him, but did say that my wife and I had an eerie night and that we didn't get much sleep because of strange noises coming from the woods. He just shrugged his shoulders and said nothing. Few people reading this will not have not heard of the Mothman of Point Pleasant, West Virginia. It terrorized the small city and the surrounding areas between November 1966 and December 1967. Its diabolical exploits were chronicled in the 2002 hit Hollywood movie starring Richard Gere: The Mothman Prophecies, named after the 1975 book of the same title written by Mothman authority John Keel. A devil-like, winged monster with red eyes, Mothman appeared quite literally out of nowhere and, some say, culminated in high tragedy and death. But how did the legend begin? To answer those questions we have to go back to the dark night of November 12, 1966, when five grave-diggers working in a cemetery in the nearby town of Clendenin were shocked to see what they described as a “brown human shape with wings” rise out of the thick, surrounding trees and soar off into the distance. Not surprisingly, they fled the area at high speed. Unfortunately for the Scarberry’s and the Mallette’s, however, the beast seemingly decided to follow them: as they sped off for the safety of Point Pleasant, the winged monster took to the skies and shadowed their vehicle’s every movement until it reached the city limits. The four raced to the sheriff’s office and told their astounding story to Deputy Millard Halstead, who later stated that: “I’ve known these kids all their lives. They’d never been in any trouble and they were really scared that night. I took them seriously.” The mystery of Mothman had well and truly begun. It still dominates Point Pleasant to this day. Further encounters with the bizarre beast were reported; however, they were overshadowed by a tragic event that occurred on December 15, 1967. 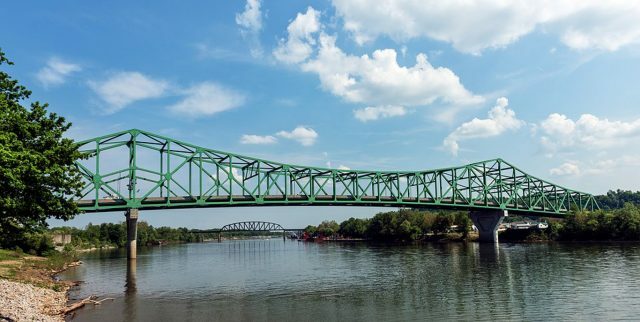 It was on that day that Point Pleasant’s Silver Bridge (so named after its aluminum paint) that spanned the Ohio River and connected Point Pleasant to Gallipolis, Ohio, collapsed into the river. It tragically claimed forty-six lives. While a down-to-earth explanation most certainly circulated – namely, that a fatal flaw in a single eye-bar in a suspension chain was the chief culprit – many saw, and still continue to see to this very day, the cause as being directly linked with the ominous and brooding presence of the accursed Mothman. Of course, the Navy installation was not the “center of such a disaster.” And, a plant did not blow up or burn down. But, it’s eerie to note that Keel was clearly very unsettled by thoughts of a then-looming catastrophe in Point Pleasant. One and a half months after writing to Mary, there was a terrible catastrophe. and, Mary Hyre, died within a short period of time of a “sudden illness”. When you look around these type of events, also look for sudden illness in bystanders of certain events. 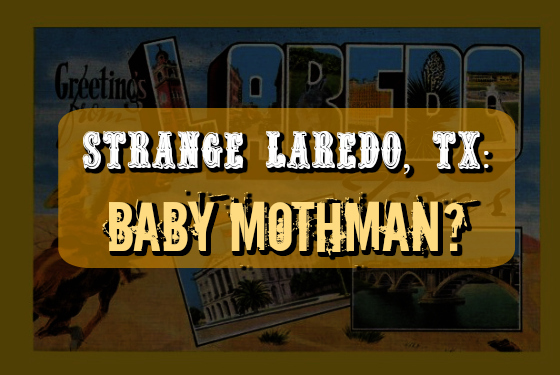 Strange Laredo, TX: Baby Mothman? Hello Sir, I am from Laredo, Texas. I had a sighting that has remained fresh in my mind for more than 20 years. I was 17 years old and had just joined a band as a lead singer/rhythm guitarist. We were practicing outside when we all automatically stopped playing and gazed in disbelief as a creature floated or slowly glided about 20 feet from the ground and about 20 feet away from us. It can only be described as as baby with small head with red eyes. He had no feathers just skin under the wings. It turned and looked at us as he was slowly gliding by. Practically anyone and everyone fascinated by the world of the strange will have heard of the Mothman: that monstrous, winged entity said to haunt the town of Point Pleasant, West Virginia, and whose dark and disturbing exploits were most famously recounted in John Keel’s book, The Mothman Prophecies. How many people, however, are aware of the fact that the U.K. is home to a veritable menagerie of creatures that eerily parallel the United States’ most famous winged-thing? If you aren’t aware of the U.K.’s equivalents, it’s time to be enlightened. The night of November 16, 1963 was a cold, clear and moonlit one. Seventeen-year-old John Flaxton, Mervyn Hutchinson, who was a year older, and two other friends, were strolling along an old country road that ran adjacent to the tree-shrouded Sandling Park, Hythe, in the green and picturesque county of Kent, England. The four were laughing and joking as they headed home after an evening spent at a local dance, when quite out of the blue something strange caught their attention: namely a bright, “star-like” object flying low in the sky that seemed to head ominously in their direction. All four watched amazed as the object suddenly changed direction, and dropped to the ground behind a thick area of trees. It was then that matters took a very strange turn. Flaxton would later recall that a feeling of dread overcame the group, and that his body temperature noticeably dropped. No wonder, given the fact that as they scanned the area, the object quickly loomed back into view from behind the trees; it could now be seen as “golden [and] oval-shaped,” and proceeded to follow the four from a distance of around 200 feet. Needless to say, the terrified teenagers broke into a run and fled the scene. To their relief, they finally seemed to lose the object and it vanished from view. But worse things were to come, however; much worse. Without warning, out of the trees emerged something else; something far more terrifying: namely a tall, dark, winged figure that the teenagers could only describe as looking like a human-sized bat. When it appeared to notice them and then headed in their direction in a determined fashion, Flaxton and his friends once again fled the scene. But high-strangeness at Sandling Park continued: over the course of the next few days, yet more strange lights were seen hovering over the trees; giant footprints – two feet long and an inch deep – were found; and even local journalists reported sightings of anomalous lights. Then, as quickly as the high-strangeness had begun, it was all over. The Bat-Man of Hythe vanished as mysteriously as he had appeared. It was questions such as this, and witnesses such as Jane Greenwood, that led British-based monster hunter Jonathan Downes to spend much of the 1990s investigating the affair – the extraordinary details of which were published in his groundbreaking book, The Owlman and Others. Downes is convinced that the Owlman is a paranormal entity, rather than anything physical, such as a large type of owl. Moreover, Downes was plagued by bad-luck, misfortune, and “psychic backlash” every time he immersed himself in the puzzle. Today, he has completely washed his hands of the subject and vows never to return to those dark woods. Known as “the backbone of England,” the Pennines is a mountain range that extends for almost 250 miles, and has for centuries been the setting for countless paranormal activity – including, in the late 1970s, sightings of nothing less than a giant, winged pterosaur. The strange story dates back to 1978, when British science-fiction author Ian Watson’s novel, Miracle Visitors, was published. The book told the story of a teenage boy in the county of Yorkshire who possessed remarkable skills that allowed him to project from the depths of his mind – and into the physical world – images of “pseudo-real creatures;” or “mind-monsters,” as British UFO researcher Jenny Randles calls them. One of those mind-monsters that Watson’s character creates is that of a prehistoric pterodactyl. Coincidentally, during the time that Ian Watson was still writing his novel, a young man named Paul Bennett, who lived in the county of Yorkshire, and who had had a lifetime of weird experiences that ranged from sightings of hairy creatures to angels and aliens, encountered a pterosaur of precisely the type that would surface only months later within the pages of Miracle Visitors. It’s an affair that Jenny Randles has investigated extensively. The Gazette cited the testimony of local man Kevin Chippendale, who said: “I saw it twice in the same place about 30 feet up by the Green Dragon flats. The shape of the bird is what attracted me in the first place. When I first saw it I thought it was an airplane. It had a very definite shape.” And, in the weeks that followed, other reports of giant, winged beasts soaring through the skies of Brentford surfaced; Griffin mania quickly gripped the area. In the half-light we could see an amorphous shadow of what appeared to be an enormous black predatory creature crouching over the carcass of the roebuck. If you looked at it directly there was nothing to see, but out of the corners of our eyes it was clearly visible. Adding to the “weirdness”, Mary Hyre had a mysterious death within 2 years of the main events. Hi. My husband and I live in Gary, Indiana. He came home freaking out tonight (Saturday, January 19th) saying he saw something that had to of been 4-5 feet tall with large wings that were similar to bat wings. He said it was a grayish color and it flew in front of his truck just inches of it getting hit, He said it flew up in the trees and disappeared. It was on Chase St. I figured I’d tell you about my experiences with the Mothman. When I was about two years old, I lived just outside of Pittsburgh in Leechburg, Pa. Within a short period of time I saw the red-eyed, winged dark creature, twice. First, he was looking at me from the top corner of my bedroom. Second time, he was looking from the foot of my bed, but not looking at me, he was staring at my window. My parents had just bought a new bathtub, and leaned it against the house right by my window. Later that week a massive tornado ran its course through the area I lived. It ripped the auditorium ceiling of the high school completely off. Just a short walk from my home. And the bathtub was thrown far from our home. When I was about 34, or so, a friend of mine wanted to show me the cemetery where ‘Night of the Living Dead’ was filmed, near Blairsville, Pa. As we walked past the gates around dusk, I saw what I thought was an angel statue with ruby eyes. As I walked closer the eyes glowed, not glimmered. So I continued to walk closer, wondering if it was the same thing I saw as a child. About 15 feet away now, I turned and asked my friend if he could see it, but when I looked back, it was a ten-foot tall obelisk, like the Washington monument. The head, eyes, body, and wings were gone, just that obelisk with four flat sides and a pyramid meeting the sides on top. Not long after that there were three tornadoes, massive flooding, and a murder in the little town of Blairsville. I’m no medium, but I can smell, feel, and occasionally hear the dead. Perhaps my sensitivities is the reason I was able to see him, or he presented himself to me. I believe he should not be feared, but be fearful of what his warnings are of. There are plenty of places in this world that have strange and anomalous histories, and sometimes there are bits and pieces that are not connected until years later. One very interesting tale is that of a supposed curse that was laid down by a dying Indian chief in America’s colonial years, and which may very well tie to the bizarre phenomenon of the nefarious Mothman of West Virginia. It is a story of adventure, colorful history, and the paranormal. In the late 1700s, the area of present day Ohio, West Virginia and Kentucky was being invaded in a sense. White settlers were inexorably moving West, pouring through the region’s Kanawha and Ohio River valleys, much to the alarm of the great Shawnee, Delaware, Wyandot, Mingo, Miami, Ottawa and Illinois nations of Natives who had called this place home since time unremembered. These foreigners posed an ominous threat the likes of which they had never seen before, threatening to disrupt their way of life, raze their land, and even possibly erase them from existence. In order to combat the ominous threat posed by the white man, these tribes put aside any differences they had and formed an alliance in order to come together in solidarity to face perhaps the gravest danger in their history. In 1774 there was a fierce battle between these forces, when around 1,200 proud Native warriors of the alliance clashed with colonial forces at the Ohio River, at the site of what is now Point Pleasant, West Virginia. The battle was a whirlwind of death and blood, devolving into more of a massacre when it became obvious that the Native warriors were hopelessly outmatched by the technology of the colonial forces, their arrows and axes losing out to the gunpowder and muskets of the enemy, and although they fought bravely and valiantly when the smoke cleared over 300 of these warriors lie dead. In the wake of the Native alliance retreat after what is now called “The Battle of Point Pleasant,” an imposing fort called Fort Randolph was built where the Kanawha and Ohio Rivers merged, ever vigilant for the appearance of another Native army looming on the horizon. One of the greatest leaders of this confederacy was the chief of the mighty Shawnee nation, called Chief Keigh-tugh-gua, meaning “cornstalk,” who realized that fighting the colonial settlers head-on was futile and suicidal. He gradually reached out to the whites, and formed a tentative peace with them even as the other tribes regrouped and sharpened their weapons to go to all out war. Chief Cornstalk knew that this was a death wish, that it would mean the slaughter of thousands, and so he reached out to the colonial forces in order to try and work out a treaty before any more blood could be spilled on their sacred lands, choosing to keep the Shawnee nation a neutral force, although many of his tribe disagreed with this, with militant factions blooming up and threatening to tear their solidarity apart. These flames of war were actively stoked by the British, who were well into the Revolutionary War at this point, but Cornstalk felt he could make a difference, and he did. Indeed, Cornstalk’s treaties that he managed to arrange at Fort Pitt in 1775 and 1776, were the first Indian treaties ever recognized and negotiated with the United States, and he was well-known for his powerful presence and negotiation and oratory skills. He meant to do this again in 1777, as a storm brewed on the horizon in the form of the angry Native nations and the militant factions of his own tribe planning an all out assault on the fort, something the British couldn’t have been happier about. Sadly, things would not go as planned for Chief Cornstalk. I was the border man’s friend. Many times I have saved him and his people from harm. I never warred with you, but only to protect our wigwams and lands. I refused to join your paleface enemies with the red coats. I came to the fort as your friend and you murdered me. You have murdered by my side, my young son…. For this, may the curse of the Great Spirit rest upon this land. May it be blighted by nature. May it even be blighted in its hopes. May the strength of its peoples be paralyzed by the stain of our blood. Not long after this, in 1794, the quaint town of Point Pleasant would be founded right there where Cornstalk had died and so many of his people had been ruthlessly slaughtered. In 1840, Chief Cornstalk’s remains were disinterred and relocated to the Mason County Court House, and they were moved yet again in the 1950s and reburied at Tu-Endie-Wei Park, with a 12-foot tall monument in his honor erected to overlook his grave. It would seem from the tragic events that would plague Point Pleasant that perhaps Chief Cornstalk did not approve of any of this, and his supposed “curse” is written all over the history of the town and the surrounding area. The series of tragic events over the years reads like a horror story. In the 1880s a fire destroyed a large chunk of Point Pleasant. 1907 there was a horrific mining disaster at nearby Monongah, West Virginia, an underground explosion that would collapse the tunnels and claim the lives of over 360 miners. Spookily, the erection of a monument to Chief Cornstalk in 1909 was beset with some acts of God when a crane working on the 86-foot-tall statue was struck by lightning, delaying its construction and dedication ceremony, and the statue itself would be also be struck by lightning in 1921 on an otherwise clear evening, damaging it. On April 21,1930, the Ohio State Penitentiary was ravaged by a fire that would burn prisoners alive in their cells and kill 320 people. In 1913 and 1937 the Ohio River experienced catastrophic floods that nearly erased Point Pleasant from the map. 1944 saw 150 people killed in a series of tornadoes that tore through the region, and in 1953 there was a horrific barge explosion that killed 6 men. Of course there is the notorious Silver Bridge collapse in December of 1967, which sent 46 people to the bottom of the Ohio River and which was surrounded by all manner of paranormal phenomena. The following year, in 1968, there was a terrible plane crash, when a Piedmont Airlines Flight 230 fell from the sky at Kanawha Airport along with 35 doomed souls. Another tragic plane crash occurred on November 14, 1970, when a Southern Airways DC-10 smashed right into a mountainside near Huntington, West Virginia, to kill 75 people. This tide of death and carnage would continue well into the 70s and beyond. In March of 1976 the Mason County Jail at Point Pleasant was targeted by a terrorist attack when the husband of one of the inmates, a Harriet Sisk, blew himself, his wife, and three police officers to smithereens with a suitcase packed with explosives. In 1978 a train carrying toxic chemicals spectacularly derailed at Point Pleasant, contaminating the water supply. That very same year 51 construction workers were killed at the nearby town of St. Mary’s when their scaffolding collapsed as they were working on a cooling tower at the Willow Island power plant. Eerily, the supposed “curse” died down after this, fitting into the common notion that Chief Cornstalk’s curse was meant to last just 200 years. Many of you might have already made the connection between this supposed curse and the bizarre entity known as the Mothman, but for those who haven’t it is very famous lore that the days leading up to the fatal 1967 collapse of the Silver Bridge spanning the Ohio River were haunted by all manner of strangeness, from UFOs, to Men in Black, to the insidious entity known as Indrid Cold, to numerous sightings of a winged entity with glowing eyes known as the Mothman. This strange entity is widely believed to have had some connection to the disaster, whether just an observer, a portent of what was to come, or even the very one that caused it, and with the Cornstalk legend it takes on a new light, as there are some who feel that it could be part of the curse or even the “Great Spirit” the chief spoke of. The connection between an old Indian curse and Mothman might seem tenuous, but it invites speculation on whether the Mothman phenomenon and the disaster it hovers around could have their basis further back in history than many might think. There is also the matter of whether this “curse” was ever real at all, and if it was just how much it ties into all of the tragedy that befell this normally peaceful place, and as the paranormal researcher John Keel once said, “When it comes to the paranormal world, nothing is what it seems to be.” Was this all coincidence or just bad luck? Was there ever any connection to the events of the Mothman phenomena of Point Pleasant and the curse of Chief Cornstalk? There is no way to really know for sure, but one thing we do know is that West Virginia is orbited by its fair share of strangeness, and a bloody history that may or may not be influenced by an insidious curse. My husband was on Facebook and saw this article that you wrote and immediately showed it to me because I am certain this is the creature I saw 8 yrs ago in 2011 around this same time of year (winter) when I was on my way to work. The events unfolded as such. I was driving down Rd 1 in between 400 and 500 S. Now this location is in Randolph County just ten to fifteen minutes kind of east from Prairie Creek Reservoir. This is why the article caught my husband's attention from the beginning. Anyway, as I was driving I saw what appeared to be a human crouched down in the road. As I got closer and the more I slowed down it did not move, so I was at a complete stop. This thing slowly turned its head to look my way and it had greenish yellowish-like eyes, like the color of cat eyes. It stared for maybe three seconds and then proceeded to slowly get up from its position, like a human would stand up because it had legs. It turned towards my car. It stepped on my car and used it to take off. Then it lifted off like a glider towards the sky. I turned my head just in time to see it tuck its legs into its body, so it did appear as a bird in flight...kind of. Its wingspan was wider than anything I've ever seen on an animal in my life. I told my husband what had happened and he told me it had to have been a bird...until he saw this article. 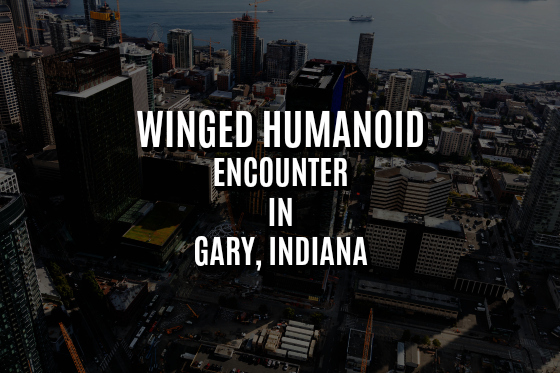 Earlier this month, I wrote about an Indiana man’s very mothman Christmas, in which he saw a large flying humanoid near the Prairie Creek reservoir. Like many other big-name paranormal entities—bigfoot, fairies, the greys—where there’s mothman, there’s a heavy dose of high strangeness with him. 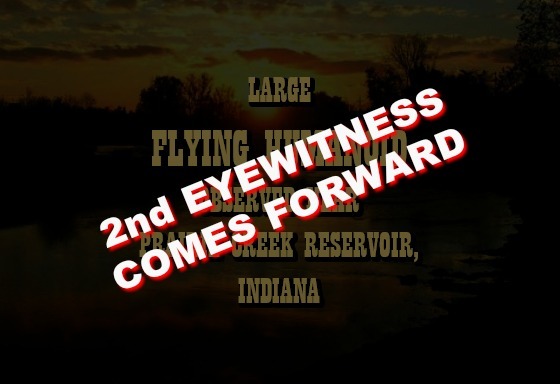 After the recent mothman reports began circulating, other witnesses have come forward with their experiences in the Great Lakes region, including a man who has allegedly observed glowing orbs of light near the Prairie Creek reservoir for decades. Since the, the witness says, he has observed this phenomenon approximately 12 times since 1981. 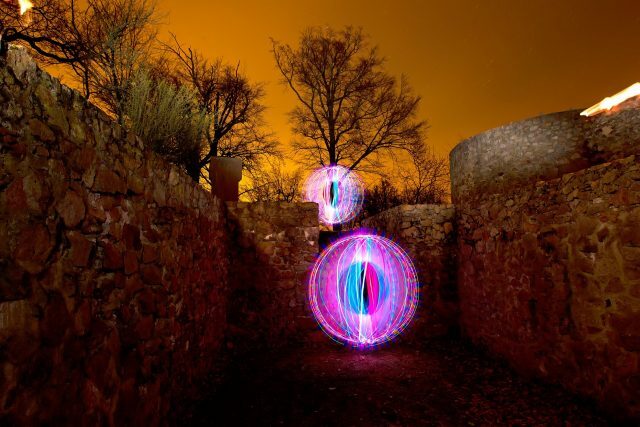 The balls of light vary in colors, sometimes appearing as orange and sometimes as white. They also appear to have an intelligence behind them, the man says, as they change color, move around, and seem to react to observers. Or maybe it’s Indiana’s newest disco sensation lighting up the dance floor: Mothman and the Orbs. It’s the old joke: what if bigfoot is just blurry? The problem is that a lot of these experiences do suggest an intelligence behind them, and an intelligence—especially an intelligence with a trickster inclination—would certainly make it as difficult as possible to take a picture of it. But it also becomes an easy out when you’re just making stuff up. Which, again, fits the M.O. of a trickster intelligence. As I said, a sticky wicket. Most times someone calls anything an Indian burial ground, I can’t roll my eyes hard enough. Nine times out of ten, it’s a pile of rocks left by a 19th century farmer who found he had more than he needed for his stone wall. But there are actual Native American burial and ceremonial grounds. Mounds state park is one of them. However, lines are easy to draw. These phenomena seem to be necessarily proof proofed. Yet some of the strangeness lies in how similarly the phenomena tend to defy documentation. That similar tendency can be seen as evidence for its existence, or evidence or its nonexistence. Which could be seen as by design. Or it could be seen as an interesting psychological phenomenon. It spirals infinitely. Which could be seen as….nope, that way lies madness. Maybe the best we can hope for is a continued collection of these stories, both genuine and otherwise, and a more complete (but never finished) picture of our strange world.